I’ve made this twice in the last 3 days, so that oughta tell you how delicious it is. My husband was actually a little worried that I might O.D. on it! Too much cabbage for one person can be a little scary! But OMG! It was so delicious! I made a big HUGE batch of it for meal prepping on Sunday, so that I could dip into it through the week. So… here’s how it went down. It all started with NO TOMATOES! I almost always have tomatoes on hand to make my staple Greek salad. I seriously eat a Greek-inspired salad at least 3-4 times per week. So when I was in the mood to munch of fresh greens the other day, and I looked over at my EMPTY tomato bowl, I PANICKED! 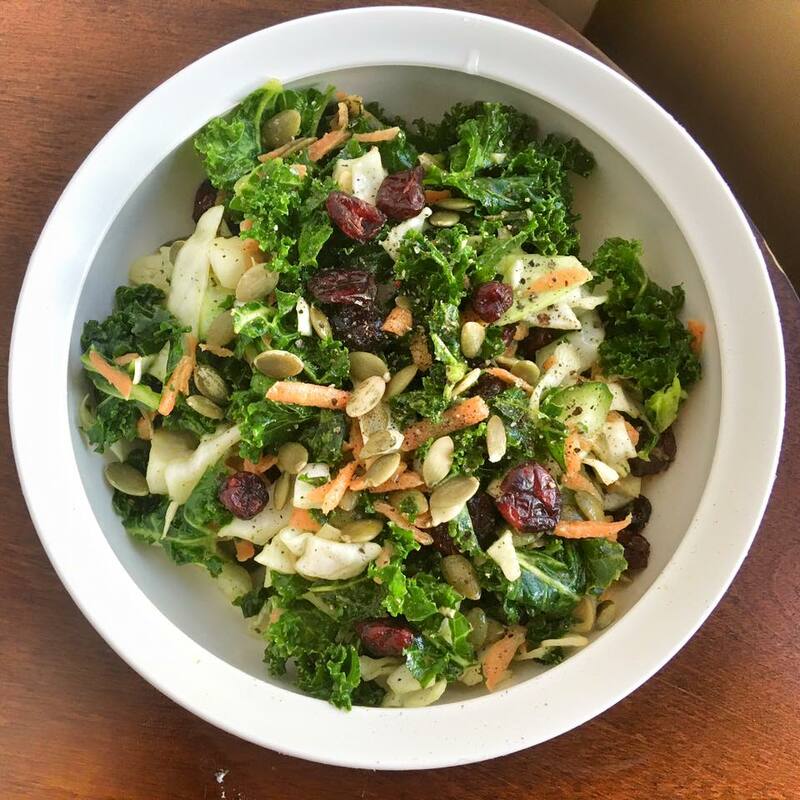 I scanned the frig and pantry and came up with some bags of kale from our local CSA farm, a head of cabbage, a big bag of carrots, pepitas (pumpkin seeds) from Costco and some organic dried cranberries. It was looking promising! Dressing: Homemade Creamy Garlic Dressing (this stuff is the BOMB! – seriously drinkable!) Just 2-3 tablespoons will do. Umm….just toss it all together and try not to eat the whole dang bowl! 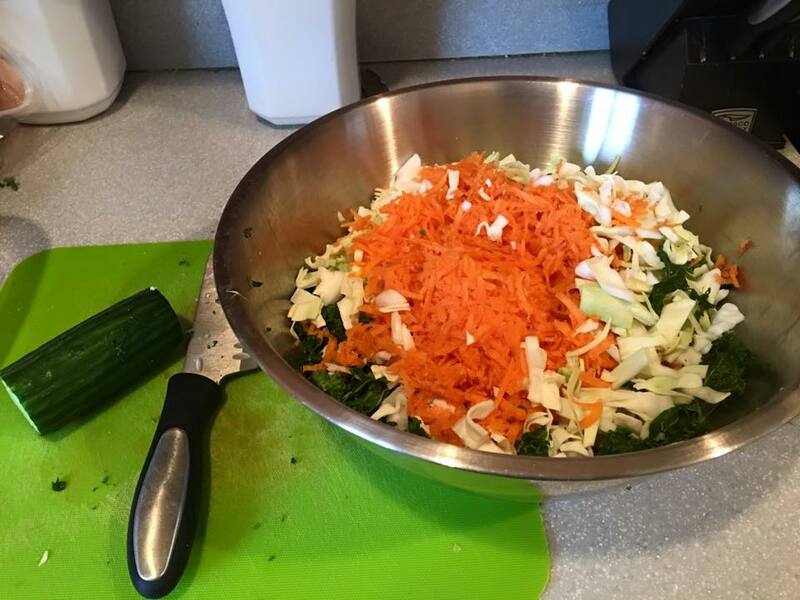 *The kale and cabbage stand up nicely to the dressing, so it doesn’t get soggy even a few days later! A lettuce salad would be pretty limp and wilty by then! My husband loved this salad, too. It’s nice and crunchy and the flavors are…AHHH!!! Just try it! I promise, you’ll love it! Feel free to get creative! What else would be good? What’s on SALE this month!? This looks delicious! Do you put all the dressing on the salad and let it soak in and then count it as 2 greens, 1 orange? Or do you leave it plain and put 2-3 tbsp dressing? Thank you! It’s definitely one of out favorite salads! I just put 2-3 T on the whole salad when I make it. It keeps on the frig for up to a week. Sometimes when I pull it out to eat I’ll drizzle just a bit more dressing on it, but it’s usually tasty as is. For a big bowl, I count 2 greens and 1/2 to 1 full orange. Previous PostPrevious Fit for February! *Take a Leap this year and save $70-$95!